Growing up in Highland Park, Illinois, in a midcentury modern house my father designed in 1958, I was so influenced by my father’s enthusiasm for architecture and the beautiful home he designed that I too became an Architect. 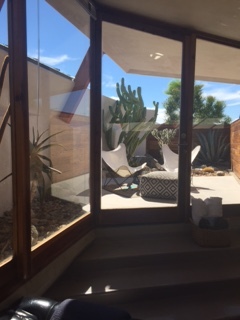 Now that I’ve embarked upon my career as a Realtor, I’m excited to be working in the Palm Springs area where there is an abundance of beautifully designed homes and historical Midcentury Modern architecture. 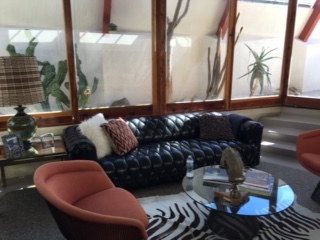 This other weekend I had an opportunity to visit the Hotel Lautner when my brother, who is also an Architect in Los Angeles, came out for a weekend stay. 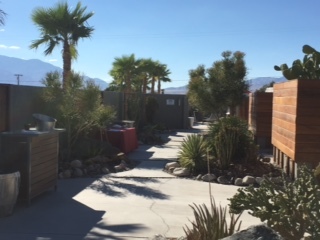 The Hotel Lautner is located in a very remote and residential neighborhood on the outskirts of Desert Hot Springs. 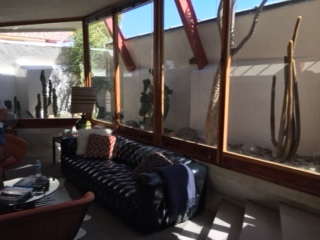 It was designed and built by John Lautner in 1947 as a master planned community of over 100 buildings, storefronts and pools on 600 acres in Desert Hot Springs. Lautner’s client was the famous actor director Lucian Hubbard, the winner of the very first Best Picture Oscar for the silent movie Wings. After building the first four unit prototype and pool, which sat cater-cornered from the property, the project came to a halt and was subsequently used for Hubbard’s stars and starlets as a get-away from Los Angeles. It gradually fell into disuse and sat vacant for almost 20 years. After Hubbard’s death in 1972, the 600 acres were subdivided and sold off; the pool structure burnt down and the land was purchased by the neighboring golf course to be rebuilt in a different design as their clubhouse. 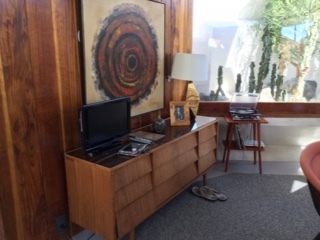 The prototype units, were purchased by a buyer from San Diego but they sat empty for another nine years until an interior designer converted them into small apartments in the 1980s. This owner kept the property for almost 20 years until 2000, when she sold it to Steve Lowe, a former associate of William S. Burroughs. Lowe repaired, repainted and furnished the units with post – war furniture, and return the units to motel use. The motel again became popular destination. Lowe was still working on correcting drainage and other issues when he died suddenly in 2007. The family did not want to retain the hotel, and put it on the market. Finally in 2008 interior designer, Tracy Beckmann, and furniture designer, Ryan Trowbridge, purchased the motel and began a renovation that lasted nearly 4 years. Their efforts won the approval of the Lautner Foundation, who sanctioned its renaming as the Hotel Lautner, in honor of its architect. The hotel reopened for business in September 2011. 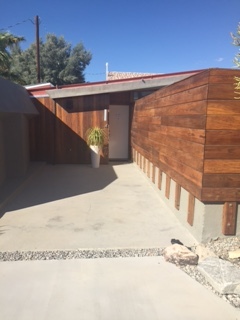 The owners were awarded the 2011 award for Best Commercial Renovation by the Palm Springs Modernism Committee. Since then the Hotel Lautner has been featured in world renowned publications and has received many accolades, including the 12th Best Designed Hotel in California by the California Home Design Committee; One of the Best New Hotels by Conde Nast Traveler; and One of the Best Road Trips in the Nation by Travel & Leisure. This year, the Hotel Lautner will host its first signature event for Modernism Week, Amore Modernista, a celebration of all things Italian and Midcentury Modern. 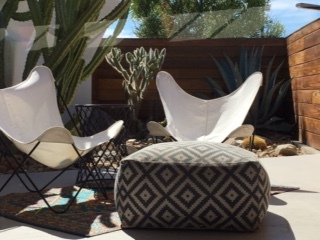 Tickets for Modernism Week events went on sale this week.